Open Wednesday through Monday from 6 a.m. to 9 p.m. Closed Tuesdays. 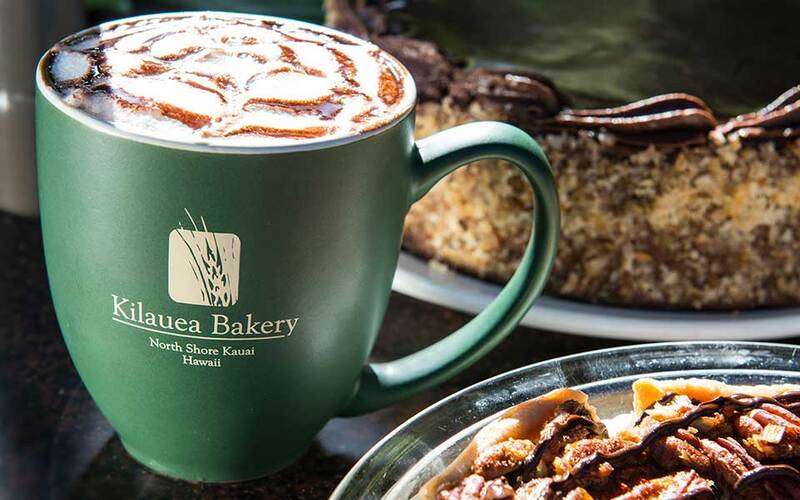 A bakery, cafe, and pizzeria, Kilauea Bakery & Pau Hana Pizza is a great spot to rub shoulders with locals and visitors alike. Tropical Danish and yummy confections infused with macadamia nuts, lilikoi, and other exotic and exciting flavors, as well as fresh breads–the Hawaiian sourdough gets rave reviews–grace the bakery menu. Sandwiches, homemade soups, salads, and calzones round out the lunch and dinner menus, but the pizzas are the main attraction. With a wide variety of toppings to choose from, as well as vegetarian and gluten-free options, you really can’t go wrong. And don’t miss the opportunity to try one of the specialty pies. The Island Stylin’, a traditional ham and pineapple pizza, is always popular, but adventurous palates should try the local favorite, the Billie Holliday–smoked ono (wahoo), spinach, roasted onions, Gorgonzola rosemary sauce, and mozzarella. Menu and ingredients are subject to change. At Kilauea Bakery & Pizza we cater to all special dietary needs. In the pastry/bakery area keep in mind there are forty or so delicious varieties and personal creations under headings such as Tropical Danish, Specialty cakes or Chilled pasties that for proper justice need to be seen first hand. Four fresh, hot & hearty soups a day from over 100 of our recipes. Organic Steamed Milk or Organic Soy Milk. Includes fine garlic infused olive oil, Mozzarella cheese, homemade sauce, and our own semolina crust. Feel free to specify how you like your pizzas. These delicious creations are time tested, great pizza combo’s. Try one and you’ll see why. Smoked ham, fresh pineapple, chipotle peppers, garlic, and Mozzarella cheese. Sun-dried tomato, garlic, basil pesto, roasted onion, Mozzarella and Asiago cheeses. Chipotle barbecue pizza sauce, pineapple, pepperoni, sausage, garlic, herbs, Cheddar and Mozzarella cheese. Basil pesto, sun-dried tomato pesto, fresh mushroom, roasted onion and Mozzarella cheese. Mushroom, green pepper, garlic, onion, olive, tomato and Mozzarella cheese, or soy cheese. Smoked Ono, spinach, roasted onions, Gorgonzola rosemary sauce and Mozzarella cheese. Shrimp, tomato, roasted garlic, capers, squeeze of lemon, Asiago and Mozzarella cheeses. Smoked ham, Pepperoni, Italian sausage, roasted onion, pizza sauce and Mozzarella cheese. Our Smoked Ono, tomatoes, capers, garlic, parsley and Mozzarella cheese. Barbequed chicken thighs, roasted onions, roasted red peppers, mushrooms and Mozzarella cheese.